La FIMO ® modeling clay is one of several brands of oven hardening clay ideal for creating small items and, if you have the patience, for making jewelry and beads, like Magali does. We can see her work in the creative artists page "Fantasy Fimo jewelry" and also share in some of her secrets and hints here. « First things first. Oven hardening clay isn't to be entrusted to just anybody. Never forget this is a chemical product. The manufacturers advise against the under 8s using this clay. As soon as you start modeling, the clay will rub off on your hands, and young children might rub their eyes or put their hands in their mouth regardless. Better to use salt dough or natural clay with these younger children. Oven hardening clay comes in several different brands. The best known is Fimo, which comes in two ranges - "soft", instantly workable, or "classic", which has to be worked before use to give it its suppleness. The "soft" has disadvantages, such as fragility in certain circumstances, for example when using the Millefiori technique. Sculpey clay is a very flexible clay that comes in bright colors, even fluorescent shades, so much appreciated by teenagers. It does, however, leave a greasier feel on the hands when worked and a stronger odor, especially whilst being baked. Then there's Cernit, GemColor and CreallTherm. As it's a bad idea to mix clay from different makers together, we generally stick to just the one. 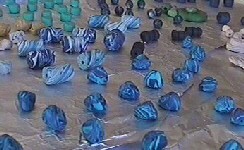 Fimo clay is a totally different matter from other clays when it comes to baking. Unlike salt dough, which takes hours to bake, or natural clay, which requires very high temperatures, Fimo clay cooks in half an hour at 130C (266F) (or less if the pieces baked are thinnish). If using Sculpey clay, allow 15 minutes at 266F for 1/4 inch width of clay. Keep to the manufacturer's instructions and above all, never increase the baking time (the clay releases chemical fumes in this case). Bake in a well-ventilated room, away from children and never in a microwave. Useful to know : when taken from the oven, the clay hasn't yet its definitive consistency, it must cool before it can fully harden. We emphasize these precautions because, let's not forget, this is a chemical product. Remember too that the clay "attacks" plastic and sticks to metal so you need to work on for example, a melamine-coated surface and set the pieces ready for baking onto baking paper and never directly onto a baking sheet.